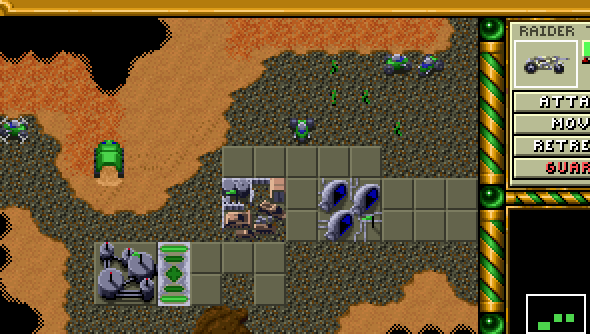 I have vivid memories of the first time I played Dune 2. It was on a demonstration machine in an enormous PC World and I completed the first two levels in about twenty minutes. I immediately got what this game was about and I was totally hooked. That must’ve been, oohh, twenty years ago now and yet we can still see the enormous influence it’s had on real-time strategy games. Fancy folding space and taking a journey back to the past? Click through for the link. You can find the game here, but be warned, it seems to be a tiny bit buggy. The first Ordos mission completed itself immediately without me having to press a button. That said, the Ordos aren’t strictly canon anyway, so who cares? Green is a rubbish colour, too. Don’t worry if it takes a little time to load and no, I’m afraid you don’t seem to be able to turn off the music. Sorry about that.